John Edward Smith, EJ to his friends and family, was born on 27 January 1850. He attended school until he was 13, and then operated a steam hammer at a nearby forge. In 1867, at the age of 17, he went to sea; serving as an apprentice on the Senator Weber, owned and operated by A. Gibson & Company of Liverpool. EJ married Sarah Eleanor Pennington on 13 January 1887. Eleven years later on 2 April their daughter Helen Melville Smith was born. becoming Captain E.J. Smith, RNR. Though he was not a captain by rank, it is a maritime custom to refer to a ship’s commanding officer as Captain, regardless of his or her rank. 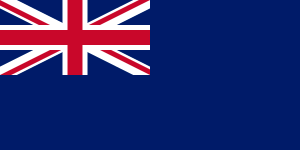 Later when EJ was promoted to the rank of commander in the Royal Naval Reserve, ships under his command were authorized to fly the blue ensign of the Royal Naval Reserve instead of the red ensign of the British merchant marine. 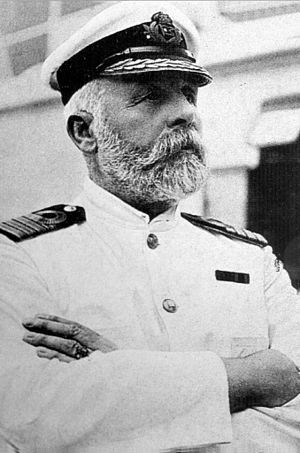 EJ was the captain of the SS Majestic from 1895 to 1904. In 1899, the Majestic made two trips to South Africa, transporting troops during the Boer War, for which EJ received the Transport Medal with the “South Africa” clasp. From 1904 on Captain Smith took command of the White Star Line’s new ships, starting with the Baltic. After the Baltic, he took command of the Adriatic, then the Olympic, and last the Titanic, each ship was the largest in the world when it made its maiden voyage. Captain Smith was the most experienced and highest paid of all ship’s captains among the merchant marine ships on the Atlantic Ocean. On 20 September 1911, while commander of the Olympic; EJ was in a collision with the cruiser HMS Hawke. The two ships were in the shallow, narrow waters near the Isle of Wight. As the Olympic passed the Hawke, the pilot ordered Olympic’s speed increased. Suddenly, the Hawke veered to port and rammed the Olympic. At the inquiry into the incident began, the Admiralty put forward a defense based on a new theory. Professor John Biles and American Naval officer David Taylor testified for the Admiralty that as the Olympic traveled through the water the bow would push water out away from the ship. As the Olympic’s stern passed, water would pull back in towards the ship. Based on the size and speed of the Olympic at the time of the collision the zone of influence would extend for 200 yards on both sides of the Olympic. This was a new theory, and of course, it was attacked as nonsense by merchant marine unions, industry magazines, writers and other maritime experts, including Captain Smith. Nevertheless, later after the Titanic sank, the new theory was proved correct. On 10 April 1912 while leaving Southampton Titanicencountered a similar incident. With Captain Smith in command and the same pilot, George Bowyer, on the bridge giving orders, the Titanic was speeding up as it passed the SS New York in shallow, narrow waters when the New Yorkparted (broke) its mooring lines and began to be pulled towards the Titanic. This is the incident that author Walter Lord pointed to when he stated “… ships had gotten too big for Captain Smith.” This is the same incident that expert after expert points to when stating that Captain Smith did not understand the new larger ships. Even though these experts do not understand the relationship between ship’s captain and pilot; if that was all that happened, a few minutes after 12 PM on 10 April 1912, then those experts may be correct. However, Captain Smith did something unusual, while the ship was under the command of a pilot; Captain Smith gave a direct order countermanding an earlier order by the pilot. He ran Titanic’s port engine ahead slow, and then ordered all stop. As the Titanic was approaching the New York, pilot Bowyer ordered the ship speeded up and the port engine reversed. Reversing the port engine would help the ship in its turn to port. Speeding the ship up would put more water past the rudder and help the ship turn. Think of a ship as a hole in the water, a hole absent of water. As that hole moves forward, water rushes in to fill the hole left behind as the ship moves forward. With the port engine in reverse, water at the Titanic’s stern was being pushed forward along Titanic’s port side, increasing the suction effect that would be felt at the stern of Titanic. By ordering ahead slow on the port engine, he reversed the flow of water on the port side of the Titanic. This action followed by the all stop order decreased the suction Titanic was creating until the tugs could stop the Titanic. Witnesses on the tug boats, along the quay, and on Titanic all reported seeing the wash from the port propeller push the New York away. Many experts claim the tugboat pushed the New York away. But the tugboat Vulcan at full power could not push back against the New York, and was about to be squashed between the two ships; then the port engine went from slow astern to slow ahead. My opinion? Yes, but an opinion based on eyewitness testimony and science. More important, this was the statement from the Captain Gale of the Vulcan. The photographs showing the near collision, also appear to bear this out. If Captain Smith did not believe the defense the Admiralty was using in the Hawke collision, then why did he countermand the pilot’s orders? If there was no suction, changing the port propeller direction and then stopping Titanic would have no effect on the SS New York. We will never know what Captain Smith thought about the Admiralty’s defense at the time of the near collision with the SS New York. However, if he had not come around to the Admiralty’s position, he at least was willing to consider their position while attempting to avoid a collision with the New York. So, why have so many missed this? First, none of the Titanic experts are mariners with experience sailing the waters of the North Atlantic. Second, they may not fully understand all the dynamics of the hydrodynamic forces at work. Many authors have incorrectly stated that reversing the port engine from slow astern to slow ahead had no effect on the incident. Reversing the engine did not, by itself, prevent the New York from hitting the Titanic. But, reversing the engine reduced the effect enough that the Vulcan was able to break the suction of Titanic and push the New York back to her berth. Now we go to Captain Smith’s actions during the sinking of Titanic. Often Captain Smith is maligned as weak, indecisive and dazed, by authors and experts alike. However, when you look at his actions, with an understanding of chain of command and Captain Smith’s responsibilities as the commanding officer a different picture begins to evolve. decisions anywhere on the ship. When looking at officer responsibilities you will notice that the officer listed as in command on the boat deck during life boat launching is the chief officer. The first officer is assigned to the starboard side of the boat deck and the second officer is assigned to the port side of the boat deck. The chief engineer is assigned to be in the engine room to coordinate efforts in the engine room. Those persons the captain would have taken advice from and given orders to were the chief officer and the chief engineer. 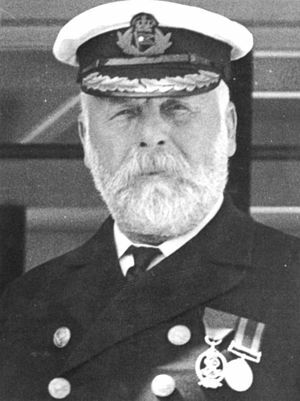 During the Titanic’s sinking Captain Smith also spent considerable time giving orders from and receiving information from the wireless operators. The wireless operators had to sign the ship’s articles, but were not members of the ship’s crew and so they did not come under the direct control of one of Captain Smith’s other officers. To best understand what happened that night we need to start with the command structure of the Titanic. the ship’s captain is unable to fulfill his responsibilities for any reason, the next senior officer assumes command. The transfer of authority is announced to the crew and noted in the ship’s log. The ship’s captain is responsible for the safety and actions of all the people aboard his ship, even if he is asleep or unaware of those actions. It may not be his fault personally, however in an inquiry he is the first person made to account. Nevertheless, this responsibility is not the same as being guilty. This is a position that can be difficult to explain to people who have never been a crew member on a ship. We tend to think of guilt and responsibility as the same. If you are responsible for someone’s death you are guilty of manslaughter, or worse. Here is an example to help explain the two, in nautical terms. You lease a car; you sign the contract and insurance papers. You hand the keys to your brother and take a seat in the back. Your brother runs a red light and causes the death of another. 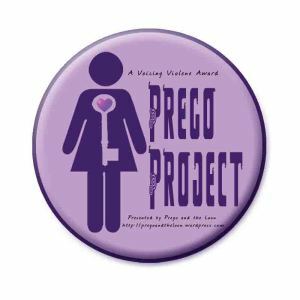 In court, your brother is held responsible for the death and guilty of manslaughter. You have no guilt or responsibility for this tragedy. If this were a ship, your brother would be guilty of manslaughter and would go to jail. You would be responsible for the death and would have your license revoked or suspended, then a court of inquiry would be convened to investigate you and determine what other actions should be taken against you. Odd? Well, in a car accident it may be. Nevertheless, this is what makes a ship run smoothly and gets the job done. This responsibility goes up and down the chain of command. The captain would never give a command to a deckhand directly, but would go through the chain of command down to that deckhand, particularly during an emergency. If the captain began issuing orders to each crew member personally it would create confusion (when those commands contradicted the orders of others) or would create a situation where you have people doing nothing waiting for the captain to tell them what to do. Confusion and inaction on a ship during an emergency costs money and lives, and has sunk more than one ship. The command structure on a ship, like Titanic, works like this. The captain is at the top responsible for the entire ship, its cargo, passengers, and crew. Next comes the department heads. The chief officer is the second in command of the entire ship. However, he is also responsible for the deck department. This is those officers and crew not in the engineering department and not directly involved with the passengers. The deck department is responsible for the navigation of the ship and the up keep of those areas not part of the engineering spaces. The chief steward is responsible for the passengers and those members of the crew who take care of the passengers. The chief engineer is responsible for the engineering crew and all of the engineering equipment and spaces. Under each of these officers are other officers, and under them the senior members of the crew who supervise the most junior of all of Titanic’s crew. For example let’s look at the engineering department. The captain is the ultimate authority, below him is the chief engineer. Below the chief engineer are junior officers. These junior officers are responsible for individual spaces, such as boiler room number five. In boiler room number five you have more junior officers, leading firemen, leading stokers, firemen, and stokers divided into watches. Each watch is under the supervision of an officer. Each watch officer supervises leading firemen and leading stokers, who in turn supervise the firemen and stokers. Each group has specific, unique, responsibilities that keep boiler room five operating at its most efficient. Each time you go down the chain of command the person’s scope of responsibility grows smaller. But, at the same time his involvement in the details of day to day operations increases. All information flows up and down the chain of command. The danger in skipping the chain of command to give orders to a member of the crew is the creation of confusion by giving contradictory orders to a man that already may be performing a vital job. Let’s say that captain Smith told a stoker to go and get emergency lights, when the lighting went out in boiler room number five. Of course, the stoker would obey the captain. But, let’s say the third engineer had told leading stoker Barrett to get a man to get a pump started in boiler room number five to pump out water. Barrett goes to one of the stokers and orders him to get started pumping out the boiler room. This is the stoker the captain has sent for lights; meanwhile Barrett, the third officer, the engineer, and yes the captain think the boiler room is being pumped out. In the mean time the flood waters are still rising in boiler room number five. Captain Smith, during the emergency would have spent most of his time talking and working with the chief officer, chief steward, and chief engineer. Unfortunately all of the men died with the Titanic. Captain Smith would have also tried to reassure passengers while he was near them. If a boat Captain Smith was near was being lowered without enough sailors, he would order a nearby sailor into the boat, of course. But he also would have informed the officer on that side of the boat deck so that he would know he no longer had that man to work with. Radio was new at sea. The wireless operators were not members of the crew, but worked for the Marconi company (they did have to sign the ship’s articles though). Among those men Captain Smith would have conferred with during those last two hours and forty minutes would have been the senior wireless operator as well. 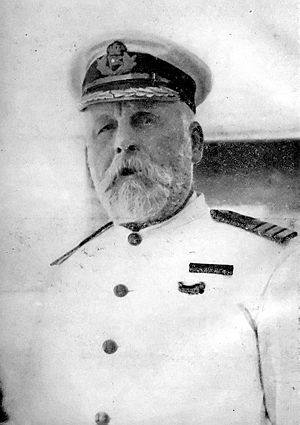 With no direct testimony giving us Captain Smith’s actions and words, some Titanic experts (like Walter Lord) have assumed he did nothing and was probably unable to come to terms with what was happening. They believe that the Captain may have even had a hard time believing what was going to happen to the ship. It is true that there is no direct testimony to his words and actions. However, we do have indirect testimony which shows that Captain Smith was active in keeping the ship afloat as long as possible so that as many people could be saved as was possible. I go into this in more detail in my upcoming book Titanic, the Journey Begins. FIRST: Captain Smith did not repeat the same mistakes he did during the Hawke collision while Captain of the Olympic. Both incidents started the same way with similar orders by the same pilot, George Bowyer. However, Captains Smith’s actions during the New York incident were different from his actions during the Hawke incident. Those actions by Captain Smith, and the quick actions of Captain Gail of the Vulcan, avoided a collision. 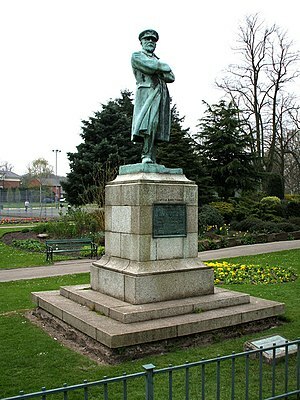 SECOND: Captain Smith did not abdicate his responsibility as his ship sank. Captain Smith relied on 45 years of experience and training in the merchant marine and navy reserve during war and peace. This experience and training told him to rely on the chain of command, clear obstacles for his senior officers, coordinate their efforts and maintain discipline. THIRD: Lastly I want to say my peace. This article should not be construed as an attack on Titanic experts and authors. We all have different experiences and background. We all have something to contribute to understanding the tragedy of Titanic. Amateurs have made some of the greatest discoveries in archeology and science; many with little or no formal training in their chosen fields. What this article is saying is that we should all be careful during our analysis to understand the circumstances and culture of the specific time and place we are writing about. If we have not sufficiently completed our research, our analysis will be flawed and our opinions wrong. People rely on the accuracy of our opinions, they take what we say as accurate and true. This is a tremendous responsibility. Too often when we are wrong, the people we wrong cannot defend themselves. I always wondered why Smith was so absent from many accounts. This helped me a great deal, especially the chain of command. I had never thought of it that way. Stupendous post! Thank you JG. To be honest, if I had not been a mariner for almost 9 years I would not have thought about it either.